PALKO POV: My (Daughter's) Summer Reading List | Maxine Platzer Lynn Women’s Center, U.Va. Traditionally, the bildungsroman that is so popular among literary novels presented challenges to the author working with a female protagonist. But, there are plenty of novels centered on girls and young women that are worth recommending - and re-reading. Inspired by my daughter’s summer reading list, I’ve decided to revisit some old favorites and (hopefully) discover new gems. This post will kick off an occasional series of responses to novels with girls as their protagonists. If you’d like to read along with me, stay tuned for my reflections. The Women’s Center welcomed alumni back to Grounds during Reunions this summer with a panel on the importance of intergenerational mentoring relationships and an open house in our newly renovated space in the Corner Building. In both of those gatherings, alums spoke to us about the life-long friendships they formed during their time on Grounds and the importance of those bonds to their post-university years. I saw these themes repeated in a recent trip I made to Concord, MA with Beth, my best friend from college, and our daughters. Her girls are two and four years older than mine, and as far as the three of them are concerned, they’re cousins. Each get-together reminds me of the power and poignancy to be found in chosen family. Last summer, my daughter read Little Women for her summer reading. 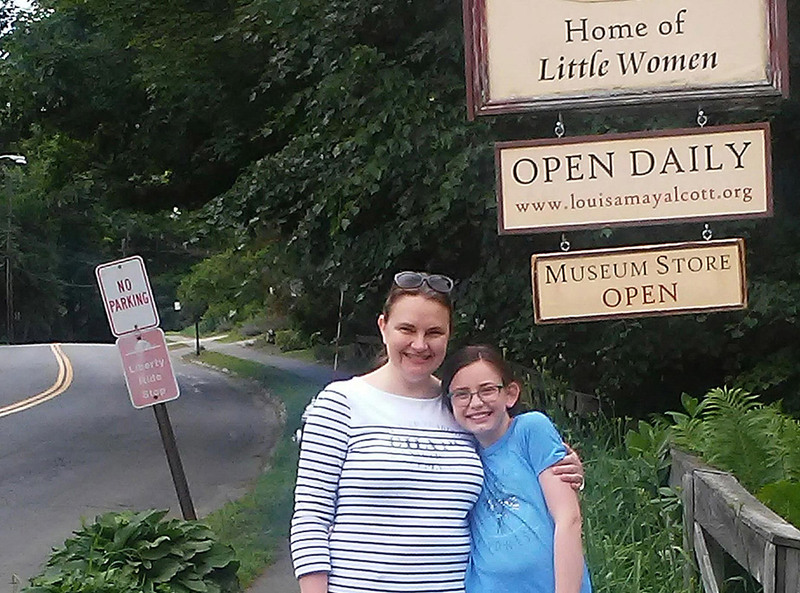 We have a tradition in our family of visiting literary landmarks, and I’ve wanted to take her to see Louisa May Alcott’s house since then. On this visit to my old friend's house, I took advantage of her close proximity to Concord to propose a girls’ trip. There is something restorative in spending time with someone who has known me since before so many milestones were passed. This deep formative relationship is one of the things that Alcott celebrates in Little Women, and her exploration of it resonates with her readers at the book’s sesquicentennial. An unexpected delight in this visit (I had been to Orchard House in the 1990s) was seeing May Alcott’s paintings. For an engrossing fictionalized account of her artistic career, I recommend The Other Alcott. I picked up a copy of Geraldine Brooks’ March in the gift shop, and I also have on my nightstand Meg, Jo, Beth, Amy: The Story of Little Women and Why It Still Matters by Anne Boyd Rioux. I love reading adaptations/expansions of novels (one of my favorite classes to teach was Jane’s Heirs, a look at the literary legacy of Jane Eyre). Childhood readers tend to bring a touchstone text or two with them into adulthood. L.M. Montgomery’s work, but especially Emily of New Moon, is one of those books whose importance can’t be captured by the mere phrase “childhood favorite”. In most corners, Montgomery is much better known for Anne of Green Gables, but Emily’s tale is perhaps more compelling through her single-minded pursuit of her literary ambitions and her grappling with the trauma of losing her parents. Judith Katzir’s Dearest Anne [translated by Dalya Bilu] has sat on my nightstand at various times over the past decade or so, and I’ve yet to have a chance to read it. I’m looking forward to sinking into this contemporary re-imagining of The Diary of Anne Frank. Sigrid Undset was the third woman to be awarded the Nobel Prize for Literature when she won it in 1928. Her citation specifically references “her powerful descriptions of Northern life during the Middle Ages,” including The Wreath, the first volume of her trilogy Kristin Lavransdatter [translated by Charles Archer and J.S. Scott]. I first read this in my undergraduate years, and periodically return to its quietly powerful exploration of a young woman’s developing sexuality. An intern shared a favorite reading from one of her courses this spring, The Infamous Rosalie by Évelyne Trouillot [translated by Marjorie Attignol Salvodon]. For years, I’d been waiting for an English translation of this Haitian text because I wanted to include it in my course on Caribbean women writers. I’m looking forward to rediscovering its engagement with the inheritance of the trauma slavery in English. Daniel Black’s Perfect Peace is another novel that’s sat too long on my bookshelf, begging to be read. The back cover blurb offers a glimpse into a family thrown into turmoil by a mother’s confession that she “made [her son] a girl.” I’m anticipating a nuanced exploration of gender roles, questions of what is “good” maternal behavior, and a mediation on identity and how we know who we are. I’m really interested in the fairytale models we offer young girls in the post-Disneyified world, so I’m eagerly awaiting the release of Betsy Cornwell’s fresh new take on the legend of Robin Hood, Forest Queen. For full disclosure, I had the joy of teaching Betsy not once, when she was a student in Johns Hopkins’ CTY program, but twice, also at Notre Dame when she was earning her M.F.A. We can find our humanity between the covers of a book. I hope you’ll join me in reflecting on your own favorite literary girlhoods, and finding a few new ones, in the remaining weeks of this summer.